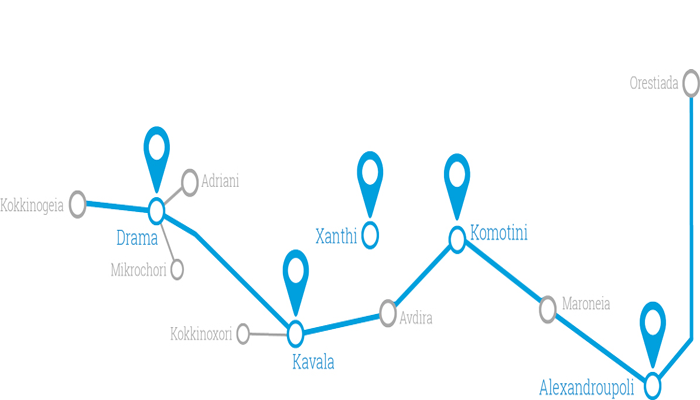 The Wine Route of Dionysus: The route starts from Mount Pangeon and the wineries of Kokkinohori at the Municipality of Orfanos, which are open to visitors. Moving on through the endless vineyards of Kavala and Mikrohori, the next stop is at the wineries that are open to visitors in the city of Drama. Surrounded by organized vineyards, you can take a tour of the production areas, the wine cellars and the tasting rooms, where you can taste award-winning wines. Going upwards to Mount Falakro, you will find the wineries of Kokkinogia at the Municipality of Prosotsani, which are also open to visitors, and, in a distance of 11 km out of Drama, you can visit the historical town of Adriani, renowned for its excellent local wines and tsipouro. Next, downwards to the Thracian Sea, the route leads to Thrace and Avdira, where, apart from the wineries, you can visit the traditional settlement, the ancient city and the archaeological and folklore museum. The route continues in Thrace, passing through Xanthi, the city of a thousand colors, with its traditional Old Town, and Vistonida, the vast lagoon that is famous around the world for its rich bird life. After a stop at the picturesque port of Porto Lagos, you will reach the center of Thrace, Komotini and Maronia, Homer’s birthplace of wine, with old houses nestling at the slopes of Mount Ismaros. The ancient wine tradition still lives on at the newly planted vineyards, where Greek varieties like roditis, assyrtiko, agiorgitiko, malagouzia and the local moscato Alexandrias, are being cultivated, along with international varieties of white, rose and red wines, as well as sweet wines, aperitifs or dessert wines, and semi-sweet wines, which accompany fish and seafood in a most delightful way. Many distilleries produce tsipouro and ouzo of excellent quality: in Thassos, you can find tsipouro of the Georgina variety, with its characteristic strawberry flavor, while Samothrace has also its own tsipouro distillery. The Wine Route of Dionysus ends at the vineyards of Alexandroupoli and the distilleries of Soufli, where the French had installed the first linear vineyards in Greece, from 1870 until World War I, on the occasion of the construction of the Orient Express line. Love wine? So do we! We will surely offer you a life time experience! Let us organize the ideal trip for you, visiting the wine routes of all East Macedonia region and tasting exeptional wine varieties!